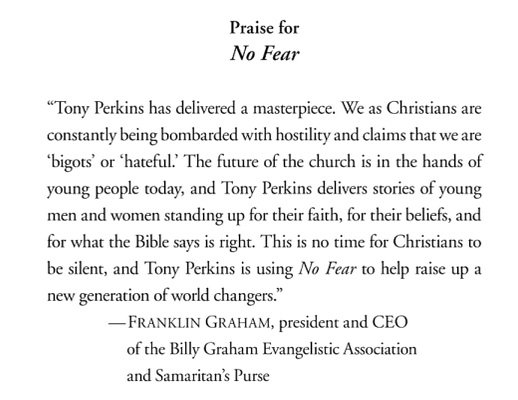 Anti-gay hate group Family Research Center President and known friend of white supremacists Tony Perkins has written a book about how hard it it is to be a Christian in America and on the last page a HUGE cross pops up so the reader can climb up on it and whine. Containing stories of young Christians facing intense opposition, No Fear shows the dramatic influence one person can have as they stand resolute for biblical truth in the pursuit of fairness, justice, and compassion. No Fear also reminds us of the biblical heroes who stood up for God in their own day and culture, modeling the same brand of courage that is needed today. No Fear will be on sale and in stores Tuesday, September 8. As a special offer, if you pre-order a copy of No Fear today, August 18, you will receive a second copy for FREE. So buy one for yourself and get one you can give to a friend, family member, pastor or better yet – a fearless young person in your life. The offer applies to the first 500 customers, so don’t miss out. What could God do through you, if you had no fear of man? Today, genuine followers of Jesus Christ face more opposition to their beliefs than in any previous generation in American history. Yet even in such a hostile and threatening cultural, it is an exciting time of opportunity for those who will stand firm in the faith. Over the last couple of years, I’ve been writing a new book titled, No Fear. Containing stories of young Christians facing intense opposition, No Fear shows the dramatic influence one person can have as they stand resolute for biblical truth in the pursuit of fairness, justice, and compassion. No Fear also reminds us of the biblical heroes who stood up for God in their own day and culture, modeling the same brand of courage that is needed today. No Fear will be on sale and in stores Tuesday, September 8. As a special offer, if you pre-order a copy of No Fear today, August 18, you will receive a second copy for FREE. So buy one for yourself and get one you can give to a friend, family member, pastor or bet yet – a fearless young person in your life. The offer applies to the first 500 customers, so don’t miss out. 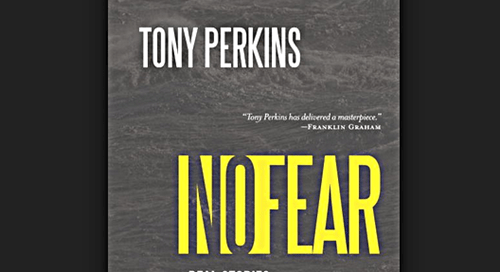 Visit www.TonyPerkins.com/NoFear for more information on how to receive your free copy when you pre-purchase. Join the No Fear movement, where courage breeds courage! When we fear God more than man, the possibilities are endless. It’s time to get started! I can’t wait to see what difference we can make as we stand for truth, firm in our Christian faith. You can leave a comment about the book at Amazon by clicking HERE. (When his Matyrfest is released that is on September 5th.) Or better yet take a few minutes and call Amazon at – U.S. and Canada: 1-866-216-1072 – International: 1-206-266-2992 and let them know that they are carrying a book full of anti-gay propaganda and adding to the revenue of a known hate group leader. Hate Group Leaders Ride The Whambulance – Perkins, Lively, and Staver: America is DOOMED! Will this “book” be available printed off on toilet paper?